Raising teenagers is hard, and we have discovered that raising 'tweens' is even more challenging. 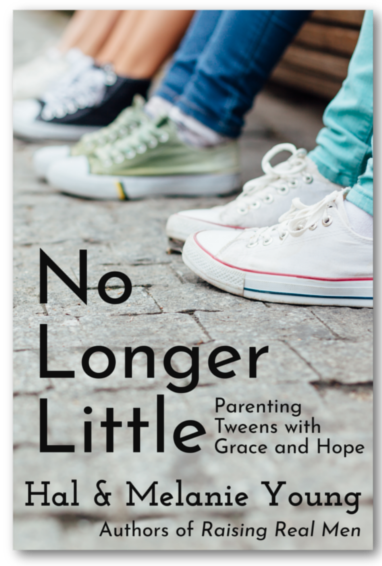 Recently I had the opportunity to review the newest title, No Longer Little - Parenting Tweens with Grace and Hope written by Hal and Melanie Young and published by Great Waters Press. What a great reminder to the eye-opening pre-teen years we are struggling with. We are surviving something totally new to us. We have teenage boys, but the girls are nearing those teen years. We are living it just a bit differently though, since all of our children are diagnosed at various levels on the autism spectrum. It was quite weird. One morning we woke up and the sweet little girls we knew were gone!! We were faced with these mean and emotional roller coasters. Since they are already diagnosed with mood disorders, we had no idea what to do. We were in constant contact with their psychologist about this sudden change in our oldest daughter, even trekking in a few times for emergency appointments. About this time, I received my copy of No Longer Little - Parenting Tweens with Grace and Hope. All I could think was....how is this going to help me??? I started reading between meltdowns, and realized that what I was reading about we were experiencing. We were on a never ending emotional roller coaster. We were living the totally forgetful and flakey behavior that Hal and Melanie were talking about. Unfortunately we were experiencing it on a much larger scale due to their diagnosis, but it was explaining a lot for me. I had a lot of friends tell me that some of what we were dealing with, was "typical" behaviors at this age. I honestly had a hard time believing them. I mean....I didn't remember acting this bad. Our sweet little girls, especially our sweet youngest was totally turning around. I'll be honest...there are days I wait for her head to spin around during a meltdown/tantrum. How could hormones be causing this much behavior change?!?! As you can from above, my copy is now full of sticky notes and highlighting. It stays on my night stand for reading and constant reminders. I actually shared this title with the girl's psychologist. He said we definitely need to watch hormones as they enter their teen years, but yes since the girls were already diagnosed with mood disorders....hormones would cause even great emotional changes. He wrote the title down to share with other parents. 1. Turn to the Bible for help. God does not leave us alone, even on our parenting journey. We don't know the full extent that Mary and Joseph needed help with Jesus, but we know they relyed on God. He can help you and give you strength. 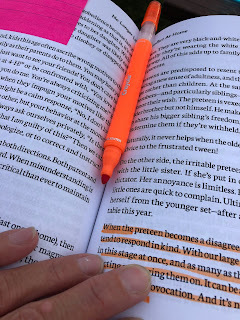 Throughout the various chapters, Hal & Melanie keep referring back to your own copy of the Bible for scriptural references on how to correct behaviors in the kindest ways possible. They remind us that referring to the Bible with your child only strengthens relationships. Your child's relationship with God, as they are sitting confused about why they are feeling like this. Your relationship with your child, as you show them that you are not perfect and need help and guidance to help them. Your relationship with God, as you continue to remember to lien on him in these troubling times. 2. I am not crazy....somewhere deep inside the person that has screamed at me for the last hour is the sweet girl I knew just a few months ago. 3. Yes your child is being disrespectful to you, and yes that NEEDS to be handled. But everything handled in due time. Tackle each situation in multiple levels. DO NOT let the bad behavior go undisciplined, but DO NOT jump straight to discipline. Help your child to see what has gone wrong and how they need to correct it. Turn each situation into a training session. 4. These years turn the ENTIRE household into an uproar. We have been experiencing this. Since Hal & Melanie have a large family, they saw this happen. They point out over a couple chapters how to handle this with the whole family. They even mention having a couple children going through this stage at the same time (the boat we are in), and they suggest how to handle this situation in the best way possible. 5. Reminder for me that when disciplining....look at all angles, including removing outside influences such as social media. Yes they are balls of hormones and emotions, but WE need to be the major influence in our child's life. Open communication about what they are reading/watching/seeing online and in movies and books needs to be discussed. They have no idea how they are truly feeling, and we need to help guide them. 6. Anger returned will not be well received. Yes your child you screaming at you...but you CAN NOT scream back at them. It's very hard, but produces nothing good. No one likes to be attacked. But I know our girls do not even remember and will deny when they are screaming at us. I had no idea that the tween years were going to be like riding a rapids. Some areas smooth and others like a rough river with strong waves and currents. As I was starting to feeling like I was drowning with my child, I had the opportunity to have the life-ring of No Longer Little - Parenting Tweens with Grace and Hope thrown at me. I'm very grateful to have their reminders as we work on correcting our thinking in how to handle the situations with our pre-teens. Now I feel more confident that I can canoe through the rapids with the girls and we can work together. Even when we feel like we are going to capsize- we can refer back to our faith and the Bible as our life-ring to stay afloat. Hal and Melanie Young have really done a great job helping parents and giving them great reminders!! 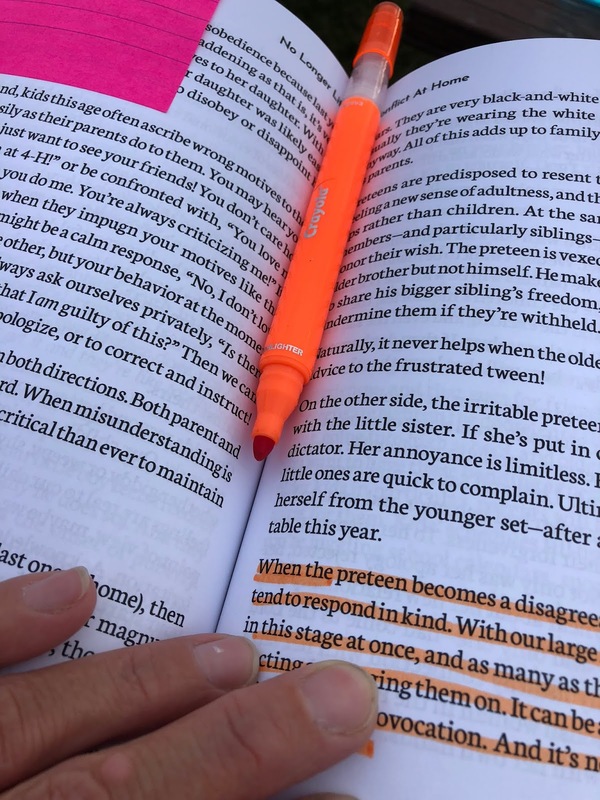 If you are heading into those emotional tween years, or maybe you have already entered this time period, I encourage you to check out No Longer Little - Parenting Tweens With Grace and Hope. It will truly help you to keep a strong relationship with your child through the rough waters!! Our copy will be well worn over the next three years! Several members of the Homeschool Review Crew were given the opportunity to review titles from Great Waters Press. Click on the link below to see how they used these titles in their homes, and what they thought of the reminders from Hal and Melanie Young.